World Way Capital is illegally operating in my country. They claimed that their address is ****. The location is occupied by the Assembly of Manitoba Chiefs. They even copied and pasted Assembly of Manitoba Chiefs' name onto their webpage. They claimed that they are regulated by IIROC. IIROC emailed me stating otherwise. You can verify it here. http://www.iiroc.ca/industry/Pages/Dealers-We-Regulate.aspx. They also claimed that the Bank of Canada is guaranteeing their investors under the Canadian Deposit Guarantee Deposit and Investor Compensation Act. Such act do not exist. 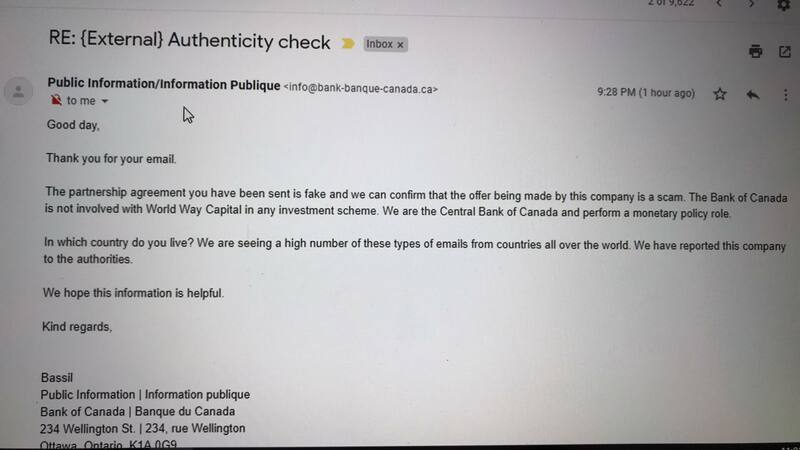 The bank of Canada had already emailed me stating that they are not working with them. In fact, they had already contacted the authorities. A day ago, my video review on youtube was flagged for a false copyright claim by someone with a eastern European name. I called World Way last night and heard someone with a eastern European accent speaking. I'd even scanned their IP address. I am convinced they are in Eastern Europe, not my country. They are professional scam artist.